Emergency services in western Poland have rescued 19 miners who were trapped underground when a minor earthquake caused a tunnel to collapse. 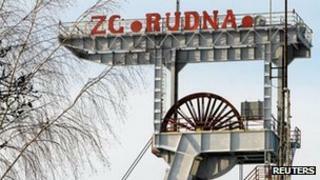 The workers at Rudna copper mine in Lower Silesia were trapped for about eight hours while rescuers dug through earth and rock to reach them. The mine is owned by Poland's largest copper miner, KGHM, and has operated since 1969. A KGHM spokesman said the accident happened 600m (2,000ft) below ground. He said the rescue operation was "difficult because huge amounts of rocks have to be removed". The tremor that caused the tunnel to collapse lasted about 10 seconds, the BBC's Adam Easton reports from the capital, Warsaw. One miner had a gash on his head, but all those who were rescued were fit enough to go home. The mine is some 400km (250 miles) south-west of Warsaw. Accidents there are relatively uncommon. Poland has a large number of mines, many of which are located in the industrialised Silesia region, which is rich in mineral and natural resources.